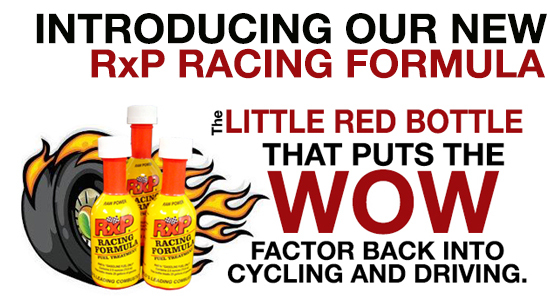 RxP” Racing Formula is based on our proven technology. Formulated just for two and four cycle gasoline engines, the performance perks will thrill you when you feel the thrust of your motorcycle, jet ski, ATV, snow mobile, and off-road vehicles on steroids. When added to gasoline, “RxP” Racing Formula gives more torque and power to your engine that you can feel! Your engine will operate at peak efficiency when you use “RxP” Racing Formula on a regular basis. One 2.5 ounce bottle treats 25 gallons of “gasoline. There are 5 to 6 treatments per 2.5 oz bottle for 4 to 5 gallon tank capacities in motorcycles, snowmobiles, jet skis and 4 wheelers. When Power & Performance is What You Seek, “RxP Racing Formula is the Answer!